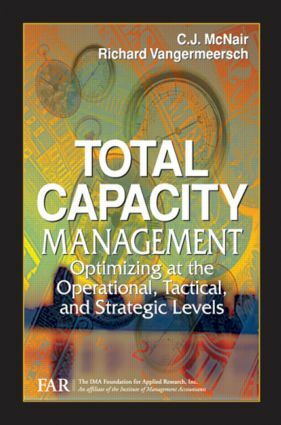 Ten years in discussion and development, Total Capacity Management provides the most complete overview of the history and techniques of capacity cost management-a timely, yet timeless, issue applicable to both capital-intensive and labor-intensive organizations. Through explanations of various capacity cost management models, executives and managers can create the most appropriate model for their organization's distinct needs. Total Capacity Management shows the way for companies and managers to gain and maintain an exceptional competitive edge. "This is one of the most useful and readable research studies published in a long time. The subject is of critical importance for every management accountant-whether dealing with cost management, budgeting, or financial reporting. I have personally used the results of this research in my client work, and it was highly relevant." "This is required reading for anyone involved in designing a capacity management and measurement system. It provides useful concepts to be considered when designing such a system, as well as interesting historical insights regarding the evolution of the current state of capacity management." "This is the most important contemporary work available on understanding and managing capacity. "Capacity management may be the least understood management challenge, yet it is clearly one of today's most difficult to resolve. Properly recognized, enterprise-wide excess capacity is one of the areas of greatest improvement potential in both the private and public sectors today. "The authors have done a splendid job of helping the reader understand enterprise-wide total capacity management. They clearly identify the importance of understanding and managing capacity at multiple levels, and the different responsibilities and perspectives required at each level. "This is a 'must read' that you will also want to keep handy as a reference document."